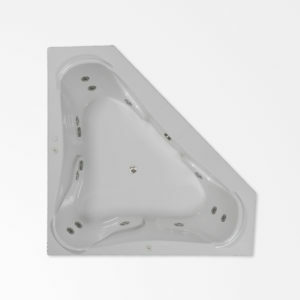 The 72 x 54 whirlpool tub made its debut in 1988 and remains one of our top-selling two-person tubs. The size of this tub allows each bather plenty of room to stretch out and relax without being crowded. Pillows, sloped lumbar supports, molded armrests, and foot wells for each bather give the 72 x 54 all the luxury you could ask for in a premium tub. Four whirlpool spa jets are dedicated to each bather, for a total of eight, and provide a complete hydrotherapy experience. The offset well makes this tub unique and adds a practical feature. It creates greater deck area than squaring the well with the deck, allowing installation of multiple fixtures and faucets and built-in soap dishes. Its shape fits both an alcove and island application, making it a versatile choice. Create your dream master bathroom by choosing the 72 x 54. As you and your partner nestle back into the comfort of all its built-in features, enjoy the peace of mind that comes with knowing that you have chosen a quality product that will last a lifetime. In fact, it’s guaranteed. Being told to go to the corner has never been so appealing. The 72 x 72, our largest tub, will make any corner in your bathroom a welcome retreat. Three seats built into the bathing well allow you to change your vantage point at will. You’ll unwind in contentment as you recline against the molded headrest and armrests sculpted into each seat. Each one has four whirlpool jets exclusively dedicated to its bather, so its occupant receives the ultimate in hydrotherapy. Streamlined for simplicity, its clean lines and genuine Lucite acrylic surface are easy to clean and maintain. 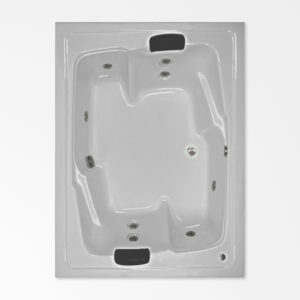 Turn the corner and take your bathroom from so-so to supreme with the 72 x 72 whirlpool tub.